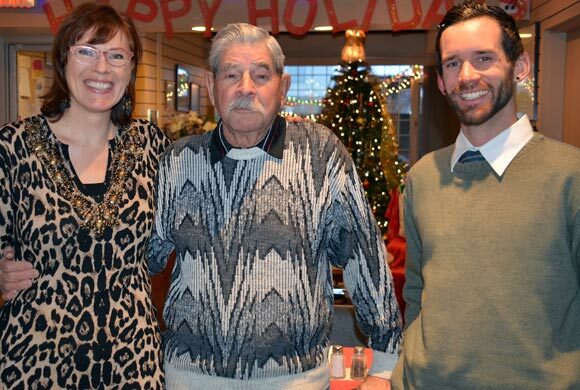 UBC students Lisa Santos and Michael Archambault flank Kelowna Korean War veteran George Barr. The class project saw 17 students in Mary Ann Murphy’s fourth-year sociology class paired with Korean War veterans from Kelowna Legion Branch 26. The assignment included exposing students to aging, diversity and inequality. They also learned about global and comparative perspectives about Korean War history, recorded the story of Korean veterans and accompanied them on the November Poppy Campaign. “I have supervised many community service learning projects, but have to say this learning was among the most profound,” says Murphy, who holds a joint appointment with the School of Social Work in the Faculty of Health and Social Development and the Sociology program of the Irving K. Barber School of Arts and Sciences. Students were required to learn Canadian history, reflect on their feelings about war and hear a variety of sentiments from the public. The students were also exposed to a host of stories, humourous and tragic, about the experiences of men who were probably their age when they fought for Canada. “This type of learning cannot be forgotten,” says Murphy. The students wrote reflection papers of their accounts. In turn, UBC students returned the numerous messages collected through the weeks leading up to Remembrance Day in the form of memory books that are on display at the Legion. Students and veterans both say they benefited from the experience. George Barr, a veteran of the Second World War, Korean War and Vietnam War, was a tank commander the first time he saw Seoul reduced to rubble 62 years ago. He returned to Korea for 60th anniversary Remembrance ceremonies earlier this year and then became involved in the UBC project. “It means an awful lot, reading those stories and seeing the pictures,” Barr says of the project. He was also impressed by the students’ approach. Fourth-year graduating student Lisa Santos says she was amazed to learn so much about the Korean War from the veterans, since so little about it was taught her in grade school. Third-year student Michael Archambault says the project changed his perspectives about war, veterans and what it means to support freedom. “We are so removed from the concept of war,” says Archambault. “It’s unfathomable to imagine, except on this kind of academic endeavour.